While working alongside Solomon’s Porch, a Christian café and humanitarian aid organization in Panajachel, we were encouraged to think about what it means to lead with a servant’s heart. For most Christians, this is not a new concept, as Jesus makes reference to living this way many times throughout the Gospels. God’s call to servanthood takes on great significance when we realize that God first became a servant for us. Philippians 2:6-7 states, “[Jesus,] who, being in very nature God, did not consider equality with God something to be grasped, but made himself nothing, taking the very nature of a servant being made in human likeness” (NIV). When we arrived on the worksite each day, our minds and hearts were ready to turn away from ourselves and towards those we were serving. Serving with a servant’s heart is about our actions, but, perhaps more importantly, it is about the intentions behind those actions. Yes, putting others before ourselves is what Jesus says to do, but he calls us to more than that—he challenges what’s in our hearts. During this week, I quickly learned that it’s easy to fall into a mindset of pride. Especially with the reputation that “mission work” sometimes receives, serving others can become more about the image you project than the work that is done and the relationships that are formed. There were a few times during this week where my intentions strayed off-course. I sometimes found myself comparing how hard I was working to others, and feeling better or worse about myself depending on how I measured up. I needed to remind myself that I can’t prove myself to God. Ephesians 2:8-9 says, “For by grace you have been saved through faith. And this is not your own doing; it is the gift of God, not a result of works, so that no one may boast” (ESV). With each day we learned better how to humble ourselves before God. 2 Corinthians 4:5: “For what we proclaim is not ourselves, but Jesus Christ as Lord, with ourselves as your servants for Jesus’ sake” (ESV). It is not for our glory that we serve others, but for God’s. It became clear to me as the week progressed that, when one leads with a servant’s heart, joy and gratitude come naturally. Even amid the sunburns, aching muscles, and dripping sweat, a sense of joy pervaded our group. When someone’s step faltered, a friend was there with a high five and an encouraging word. When the people passing bricks down the assembly line needed cheering up, someone at the front sent down amusing messages, like the game telephone. I noticed myself thanking God for the little things during these four days. I don’t think any of us have been more grateful for peanut butter sandwiches and Pringles than we were during that week. One of my favourite memories of that week was Thursday afternoon. The foundation of the house had been set and the hollow bricks needed to be filled with cement. Laura, another from our group, and I chattered about the uncomfortable sound that the sloshing cement made while trying to avoid pouring it all onto the ground. As hard and messy as the work was, my heart was singing joyful praises to God and those around me. It was a blessing to work alongside Solomon’s Porch as they provide humanitarian relief to indigenous families. As the week concluded, we began to ask ourselves how we can be servants for Jesus not just when building a house, but in our everyday lives back home. Thank you for your thoughts and prayers as we continue to explore and learn in this wonderful country. 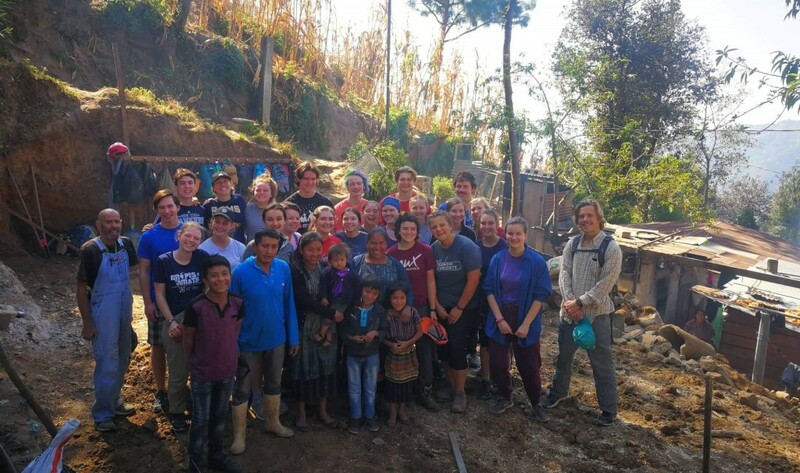 This past January, I joined our site in Guatemala during their first few weeks in country. After students have settled in with their host families and life in San Juan del Obispo, one of the first things we do is take a tour of Antigua led by one of our country partners. Any Outtatown Guatemala alumni will know this exact moment—the warmth of the sun under blue skies, the way the cobblestone roads feel under foot, and the absolute exhilaration and exhaustion of being spoken to and quizzed in Spanish (what is the word for chicken bus again?). In between the colourful new sights and sounds of the old colonial city that will soon feel like home for the students, there is a moment when our partner will pause to point out a tree. It’s an easy moment to miss, thrown in between the stop at the world’s most beautiful McDonalds and the bustling Central Park. It is after all, simply referring to a tree. But oh, what a sight it is. 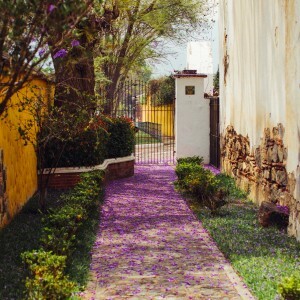 Jacaranda trees typically flower between January and April, but will come into their fullness in February and March, covering the city in a stunning canopy of violet. As a result, the flowering of the jacaranda trees is thought to mark the start of Lent, a visual reminder to pay attention to the season we are entering. Much like the unassuming stop on a tour, the jacaranda, when noticed, invites us to pause and consider where we are. While it may just be popular lore, I’m drawn to the idea of a tree whose sole purpose and design is to call our attention back to the seasons we find ourselves in. On Outtatown, we often refer to five principles for engaging with cross cultural experiences: be curious; walk in expectancy; suspend judgement; foster dignity; and be a learner. It strikes me, however, that these principles apply far beyond the context of international travel. While I don’t have a jacaranda tree flowering outside my house to visually remind me to pay attention, these principles function in the same way—calling me back to notice the way the Lord is at work around me. As we prepare for the upcoming season of Lent, my prayer for the Outtatown community is that we have greater capacity to pay attention to what God is doing around us. What season of life do you find yourself in? How can we be curious, be expectant, suspend judgement, foster dignity in those around us, and always, always be a learner?